The biggest event in the global gambling industry, the International Casinos Exhibition, is underway in London this week. In contrast to other gambling conferences, ICE London seeks to forge a connection between the offline sector and the online ‘iGaming’ sphere. The attendee list and event’s floor reflect this amalgamation, with major brands from both land-based and online casinos showcasing their products alongside one another. Organisers describe ICE as ‘the entire gambling ecosystem in one place’, referring to how not only casinos, but affiliates, payment solution providers, software developers and marketers are also represented. The jam-packed three-day event gives a good overview of the trends and topics shaping the multi-billion dollar industry. Here are a few themes at this year’s ICE which give us strong indications of what to expect for the future of gambling. The relationship between cryptocurrencies and online gambling is a natural one; both crypto-technology and iGaming stem from digital innovation, and both concern varying degrees of risky investment. As more online players wish to preserve their privacy, cryptocurrencies present themselves as a practical alternative to traditional payment methods. FinTech companies offering integration of crypto-payment solutions to online casino platforms will be making their rounds at ICE, networking with those interested in the prospect of committing to the still burgeoning world of blockchain technology. There are a number of focus points specifically for the land-based casino sector, as evidenced by this year’s exhibitions at ICE. One such technology which is peaking the interest of many attendees is that of AI facial recognition for land-based gambling establishment. The technology is developed to heighten security, strengthen statistics, and improve player experience. One provider of facial recognition is Fincore, a company which is demonstrating the benefits of monitoring player behaviour through assigning IDs to faces. The suggestion is that this technology will allow casinos to more efficiently identify valuable players, problem gamblers, and trouble makers. “The Facial Recognition system uses the latest developments in Data Science (AI) to create a more easily managed and personalised offering,” says the B2B Commercial Director Jamie Maskey. Monitoring individual players with facial recognition will help casinos personalise VIP offerings and share information on cheaters and problem gamblers with other casinos. The importance of complying to KYC (Know Your Customer) particularly in the gambling industry can not be understated, and at this year’s ICE there will be a few FinTech companies showcasing their KYC solutions. One such company is Safened, a FCA-licensed payment institution that claims to make customer verification process faster, simpler, and more thorough. With so many regulated brands looking for cost-effective means of complying to KYC in light of the 4th EU Anti Money Laundering Directive and GDPR, it’s clear to see why these solutions are proving a hot topic at ICE. “We believe that the cascading of checks is an effective way to form a holistic view on a client and in the process to filter out fraudsters. There is a lot of activity in the digital KYC space, but what sets us apart is the fact that we are a regulated financial institution that can offer an end-to-end solution”, says Kirk Gunning, CCO of Safened. For online casinos, the increasing trend of outsourcing marketing and content services is evident by the growing number of creative agencies present at ICE. “Many online casinos that have traditionally relied entirely on affiliates are realising the value of increasing the degree to which they invest in their own marketing”, explains Lucy Jacobs from PlayFrank UK. “Stricter marketing regulation means online casinos want to retain control over their own advertising for 100% compliance, but it’s also a matter of realising how important a brand’s own content marketing is for a sustainable online presence and long-term brand awareness.” Offered by the many agencies at ICE are branding services, content writing, translation and localization and SEO. A number of discussion panels will also be held with regards to the topic of marketing gambling products. 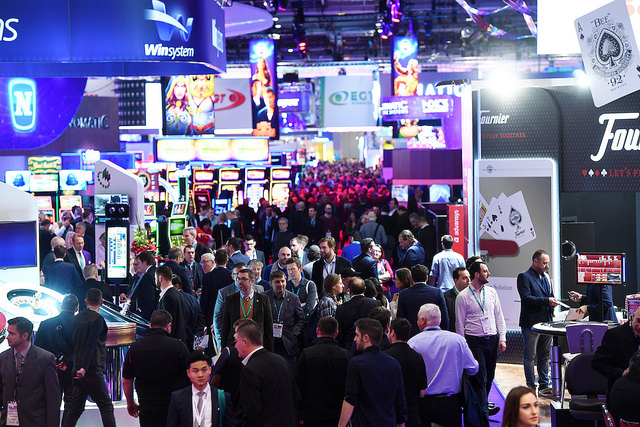 Major casino game providers will, as usual, be present at ICE – including the biggest names in the industry such as NetEnt, Play’N’Go and QuickSpin. However, this year also marks the debut of some smaller but fast emerging providers. Red Tiger Gaming Limited is a relatively young name but is making waves at ICE where the developers are showcasing their unique Daily Jackpot games. Online casinos are continuously looking to strengthen their game portfolio and will be keeping a close eye on the next big providers in the industry. Although esports betting has not yet exploded quite as exponentially as some have predicted, many existing sportsbooks believe there simply been a failure to seize the market. As such, a lot of networking is focused on bringing esports expertise together in developing a successful esports betting product. An ICE workshop held on the 6th of February will look at the potential of esports in relation to the gambling industry, focusing on an esports market overview, forecast and valuation. With the global esports market currently valued at $493 million, it seems that there are plenty of opportunities in this sphere. What sportsbooks have realised is that there are unique challenges of establishing a brand within the esports community – a community rather unlike the fanbase of traditional sports. It is these perceived challenges that the workshop intends to tackle. A record number of gambling affiliates have led to a need for more – and better – platform management tools than ever before. From casino operator’s perspective, affiliate management tools have become increasingly important in keeping track of various partnerships and their costs. The London Affiliate Conference (LAC) will be held right after ICE so that those offering and seeking affiliate deals can attend both conferences. A panel talk will initiate discussion on how to organise affiliate programs and find appropriate partners, as well as how to offer better deals as an affiliate name in an increasingly competitive field. There are 8,500 operators and 150 countries in attendance at this year’s ICE – most likely beating the record of last year’s 3,000 attendees. Though the full scope of ICE’s impact on the gambling industry is better understood in the context of an annual overview, there’s no doubt that this year’s conference will be pivotal in helping shape and reflect the discussions central to the gambling industry and its future.